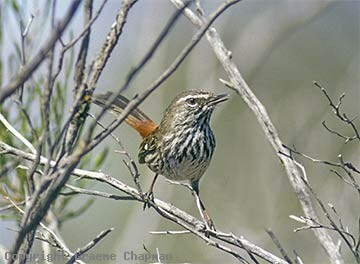 Right across the mallee lands of southern Australia in spring, the sweet sustained songs of the Shy Heathwrens drift through the air. Often heard but not so often seen, their titles "cauta" and "shy" are quite apt for they usually keep well out of view. 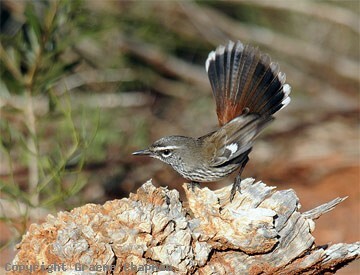 Year after year, pairs of Shy Heathwrens are found in the same little selected places, territories that no doubt provide them with all the necessary sustenance the year round. 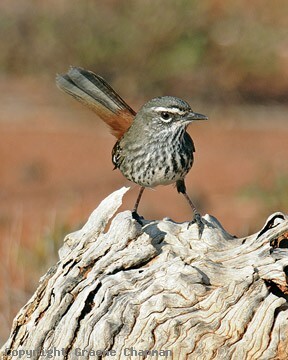 They feed mainly on the ground, poking amongst the litter and shrubbery for insects and seeds. They build their nests there also, a small dome of fine twigs, bark and grass well concealed amongst dead or prickly growth. Only the female incubates, the male sometimes singing nearby to advertise ownership of their territory, but after the two or three eggs hatch, both birds feed the nestlings. 499201 ... 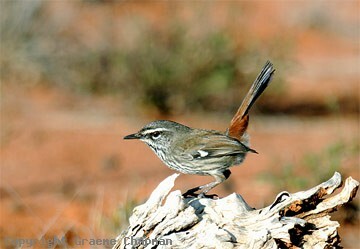 Shy Heathwren, Gluepot, S.A.